Welcome to the Elephant Parade! Beginning February 1st, I will be showing a block each week and would like to encourage you to quilt along. You can try out as many or as few blocks as you like. Make a quilt or make a mini. Make a cushion. Make whatever your imagination leads you to make! The original post about the inspiration for this baby quilt design can be found here. I have also added this Elephant Parade quilt along page that includes all the information you will need and a weekly schedule. As each post is published the live links will be added to the schedule. 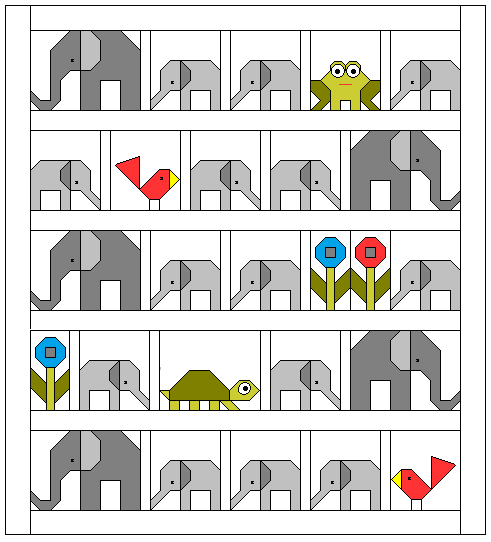 The Elephant Parade page tab is found just below the blog header. Happily, Northcott Fabrics is as excited to see this come to life as I am, and will be sponsoring this project. Follow along and watch as these bright solids from their ColorWorks cottons collection become shaped into these adorable animals! It is not necessary to purchase the pattern in order to participate. 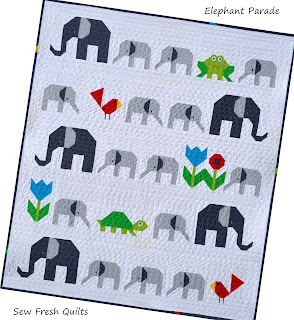 But if you are wanting to make the complete quilt, as pictured below, and would prefer the convenience of using a printable pdf pattern, Elephant Parade is available for purchase and includes complete cutting instructions and a detailed guide to finishing the entire quilt. The Elephant Parade pattern is available in my pattern store here. Piece of fusible web large enough to trace 5 eyes at 1.5” square, approximately 5" x 10"
Optional: Piece of fusible interfacing large enough to cover embroidery, approximately 5" x 10"
Press all seams open. Press seams as you go. From the off white, cut (9) strips @ 3” for row sashing and borders and (5) strips @ 1.5” for block sashing. Set sashing and border strips aside for later. From the Binding fabric, cut (5) WOF strips. I use 2.25” Binding Strips and finish the binding by machine, but if finishing by hand stitching the binding down, cut 2.5” width of fabric strips. Prepare your binding strips to make your binding and set aside for later. Or to make the Little Bit binding as used in my sample please see this post. March 29 - "SHOW IT OFF" LINKY PARTY! Afraid you may not finish in time for the linky party? This linky party will be endless. You can link up your finishes here at ANY TIME. The linky will not end. A quilt along button has been added to the right sidebar. If you are interested in quilting along, please add the button to your blog and help to spread the word. Follow along to join in the Elephun! So cute, all I need now is a grandchild! Hehe I'd love to make it anyway! Can't wait to start. Love the elephants. This will be a perfect baby quilt to welcome a new niece or nephew. Oh my heavens, I have a friend who adores elephants and I'm thinking table runner/wall hanging for her. Thank you for this! Can't wait for this!!! Just printed off this page to have as a reference! Definitely making a little wall hanging with those frog! Love those elephants! Am about to rush to the sewing room to make them in pink for my daughter who is studying wine business management. Cut the fabric today - can't wait to get started! (12) and (2) 3.5" squares - correct? What for a lovley quilt. I will cut my fabric tomorrow and I will sewing the large elephant. Oh my god, this is sooooo sweet! I have to call my sister and tell her that we need a new baby in the family! I made two large elephant blocks tonight. They are so cute!!!! I kept going back into my sewing room to take another look! I don't have any grandchildren young enough for this quilt, but my quilting guild donates over a hundred quilts every year to Ronald McDonald house, young women's shelters, etc. I'm sure a child will love this when I finish and I will have had all of the fun of making it. Thanks so much for the pattern. I have just finished my large elephants! they still need to be ironed! Everything went very smoothly. Thanks Lorna! I absolutely love the elephants! Just so much FUN! I will be a late starter but I am going to make this quilt too. I need to order my fabric and when that is here I will be ready to go. I just love it, it is so darling. Lorna, thanks for the quilt along. I finished two days ago the quilt and made a mini also. It was so fun to do and I learned a lot. The pattern is so easy to follow, but I now know how much mistakes there are possible when you do not read well. I appreciate that you take the time to comment on 'Elephant parade posts you find on the Internet. I will make your fox quilts too. This is very generous of you! Now, if you were another designer who's name I won't mention, you'd offer up this quilt along, then you'd edit all of your posts, taking out all do the measurements, and publish them in a book, leaving us slower sew-ers in the lurch with half constructed quilts and no more directions. Then you would load your website with so many advertisements, it takes forever to load. Just finished this quilt! Love it! Loved this pattern. I made it for my first grand baby . Ethan's Elephants is perfect for him. You directions were easy to follow, love the diagrams, made it easy to put together. Look forward to making other patterns you create. Thank you. I really like this pattern and would like to make it for my new grandson. But I cannot access the weekly directions for putting the individual animals together. Is there some way I can get these instructions? Have you considered enlarging the critters to make a bed size quilt? Struggling with some of the math for a full size quilt but would love to know you already did it and will sell the secret!